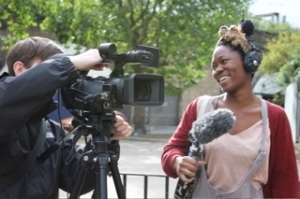 Our Digital V ideo Production for the Web course is aimed at NGOs, SMEs, charities, social enterprises and small businesses who want to produce their own online video content. There is an ever-increasing demand for high quality online video to get your message across and to reach audiences. DIY film making and successful use of no/low budget techniques can slash your production costs and actually improve the content you produce. Training existing staff or volunteers in the techniques of high quality digital film making is far more cost effective than hiring a film crew. But in addition to this, when people working on the ground record their own activities and events, capture client testimonials and document their work you can often get better results than with a hired film crew of strangers. Where your staff have built relationships and trust with your clients they can film more relaxed and interpersonal moments – moments that might elude an external film crew, making for a more direct and powerful film. Mark Saunders is an award-winning independent film-maker, media activist and writer. His expertise in the field spans over two decades. Alongside production work, in 1990 he was a founding member of INURA (International Network for Urban Research and Action). Mark has also been teaching for over 15 years, and has been a visiting lecturer at a number of institutions, including London School of Economics, the Royal College of Art, the London College of Communications, Bournemouth, Florence, and Coventry Universities. He is currently teaching at Birkbeck College. Our London based Digital Video Production for the Web training course is suitable for beginners and up. At just £600 per person it is excellent value and we offer a 20% discount to groups of more than four booking together. If you are a group we can bring our training to your premises and tailor it to your needs. We have a course scheduled for next week, and another set to run in December (3rd-5th). We will arrange more courses for individuals if there is demand so please enquire if you are interested. If you are a group of more than four, please contact us and we can run a course especially for you. For more information on prices, booking and course content, please see the training page on our website. If you are interested in booking this course visit the How to Book page. If you would like more information on future training opportunities at Spectacle sign up for the Training Newsletter.